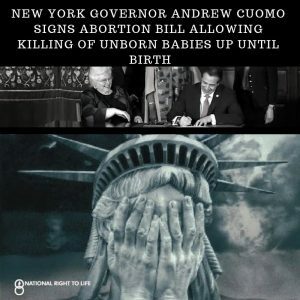 New York State Right to Life is saddened that New York now has what Gov. Andrew Cuomo ironically but rightly referred to as “the most aggressive” abortion law in the country. In a horrific irony, at Cuomo’s order, The One World Trade Center was lit up pink Tuesday night to celebrate the bill’s passage. Pink is traditionally the color used to celebrate the birth of baby girls, more than 30 million of whom have been annihilated since Roe v. Wade was handed down in 1973.